One of the most important components of job satisfaction, no matter what profession you’re in, is feeling that you are being fairly compensated. 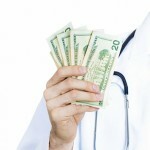 That’s a problem for physicians, many of whom think their compensation is unfair. According to a 2015 survey conducted by Medscape, about half of physicians of all specialties surveyed do not feel they are compensated fairly. Interestingly, the perception of being unfairly compensated did not correlate with the actual amount earned by members of the various specialties. The increasing number of nonclinical duties being dumped on physicians has many feeling like they have too little autonomy in their day-to-day duties. – Laurie Morgan, Capko & Morgan. For example, while orthopedists were the highest paid physicians, only 45% said they are fairly compensated. By contrast, 48% of primary care providers felt fairly compensated, even though they earn substantially less than other specialists. “Physicians’ perception of whether they are being compensated appropriately has more to do with the sense of overall satisfaction in their work and whether they have control over their destiny,” observes Laurie Morgan of Capko & Morgan, a medical practice management consulting group that is based in California. According to Ms. Morgan, the increasing number of nonclinical duties being dumped on physicians has many feeling like they have too little autonomy in their day-to-day duties. That affects their perception of compensation. A second factor is unclear expectations. Many physicians are no longer paid a straight salary, so productivity and quality metrics play a growing role in physician compensation. These metrics often use complex formulas that can be very confusing to the uninitiated. Feeling unhappy with your pay? Find a new job here. Michael Ferry with Halley Consulting Group in Columbus, Ohio, says data can provide a quick “reality check” so you can see where you fit into the bigger picture. If you’re looking at a new job and trying to decide if it pays fairly, find out exactly what will be expected of you in exchange for a dollar amount. If you feel that there has been transparency in the hiring process and around sign-on incentives, you’re more likely to feel fairly compensated once you take the job. And remember that you can always negotiate at the hiring stage. “Even if you’re told, ‘This is our standard contract,’ you can negotiate so that you’re less likely to be entrapped in an unhappy situation,” says Chris Brown, JD, of the Health Law Firm in Altamonte Springs, Fla. The less trapped you feel, the greater the likelihood that you’ll feel appropriately compensated.